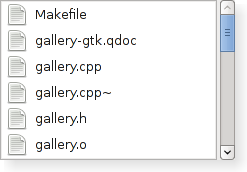 This page shows some of the widgets available in Qt when configured to use the "gtk" style. Take a look at the Qt Widget Gallery to see how Qt applications appear in other styles. The QCheckBox widget provides a checkbox with a text label. The QRadioButton widget provides a radio button with a text or pixmap label. 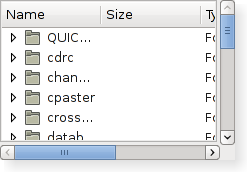 The QGroupBox widget provides a group box frame with a title. 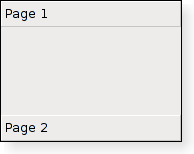 The QToolBox class provides a column of tabbed widget items. The QFrame widget provides a simple decorated container for other widgets. The QListView class provides a default model/view implementation of a list/icon view. The QListWidget class provides a classic item-based list/icon view. The QTreeView class provides a default model/view implementation of a tree view. The QTreeWidget class provides a classic item-based tree view. The QTableView class provides a default model/view implementation of a table view. 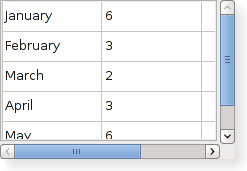 The QTableWidget class provides a classic item-based table view. The QProgressBar widget provides a horizontal progress bar. The QLCDNumber widget displays a number with LCD-like digits. The QComboBox widget is a combined button and pop-up list. The QDoubleSpinBox class provides a spin box widget that allows double precision floating point numbers to be entered. The QTimeEdit class provides a widget for editing times. The QDateEdit class provides a widget for editing dates. 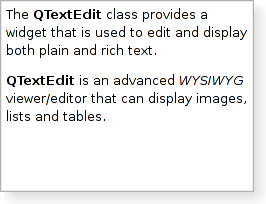 The QTextEdit class provides a widget that is used to edit and display both plain and rich text. The QScrollBar widget provides a vertical or horizontal scroll bar. Here, we show a scroll bar with horizontal orientation. The QDial class provides a rounded range control (like a speedometer or potentiometer). The QCalendarWidget class provides a monthly calendar widget that can be used to select dates. The QFontComboBox widget is a specialized combobox that enables fonts to be selected from a pop-up list containing previews of available fonts.